The sonatas which make up Buxtehude’s Opus 1 were published in an undated edition which probably belongs to 1694. Like most significant music they are both thoroughly traditional and remarkable for their innovations. Buxtehude was undoubtedly familiar with such chamber works as those of the Hamburg composer Johann Adam Reincken (1623-1722) - though long-lived, Reincken didn’t quite manage the 149 years accidentally attributed to him in Gianluca Capuano’s excellent booklet notes! - and the violinist-composer Nicolaus Adam Strungk (1640-1700), who spent two years in Rome in the 1680s, and was praised by Corelli. But Buxtehude’s work has a flair and inventiveness not accounted for by such models as he could find in Reincken’s Hortus Musicus of 1687 or in Strungk’s writing and playing. Buxtehude’s writing has a new sense of playfulness, of seeming spontaneity and of emotional expressiveness. 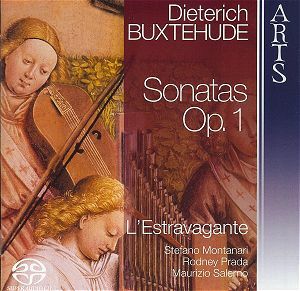 Such qualities are certainly well to the fore in this recording of Buxtehude’s first set of seven sonatas (a second set of Seven was published in 1696 as his opus 2) by L’Estravagante. These recordings (along with L’Estrvagante’s performances of the Opus 2 set) were first released as cover CDs with an issue of the excellent Italian music magazine Amadeus, during 2007. The reissue of both recordings on the Arts label happily makes them available to a wider public. These are, indeed, performances which any admirer of Buxtehude ought to hear. Harpsichordist Maurizio Salerno prompts and supports superbly, and the interplay between violinist Stefano Montari (L’Estravagante make no use of a second violinist as employed by some ensembles in this music) and gambist Rodney Prada seems almost intuitive in its exactness and fluidity. Whether in the “furioso” allegro of Sonata No.III or the melancholy andante of Sonata No.I, in the extraordinary rhythmic inventions of Sonata No.IV or Sonata No.VI’s quasi-improvisatory (and actually improvised) flights, L’Etravagante seem in utter sympathy with the requirements and (just as important) the possibilities of the music. L’Estravagante play this music with a well-developed sense of drama, with am evident fondness for strong contrasts not least in their choice of tempi). As a result they perhaps lack the relative stateliness of some other recorded performances, but they surpass any other performances I have heard in energy, exhilarating expressiveness and a winning sense of spontaneity. This is music written by a Dane who was working in North Germany, and played with the vivacity and theatricality which has characterised so many Italian performances of baroque repertoire in recent years. It makes for a heady mixture - a mixture whose effects are highly potent!